Forecasts of rain and hail and the fact that it was a long weekend did nothing to decrease the attendance at the third meeting of the MMC Inc. for 2002. In fact the day was fairly sunny but a fresh breeze made it rather cool outside but inside the hall it was warm and cheery. Overall we had 44 people attending - 38 paid-up members, 4 wives, 1 visitor and the son of one of the members. As usual, people were banging on the door to be let in at the start of the informal proceedings at 1 pm. Sales tables were quickly set up and the hordes descended on these to see what goodies, bargains etc were available. Fortunately some tone was added to this chaos by those who had brought models along for us to see and discuss. As always the hall presented a scene of animated activity during the first hour with discussions about models, general chit chat and much buying and selling. But at 2 pm sharp, our President Tony Press brought all of this to an end when he called the meeting to order in his firm but pleasant way so that the more formal proceedings could get underway. This time we had one visitor come along, Jeff van Hees, who heard about the club via our web page. 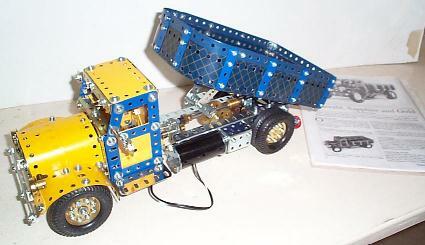 Jeff's is a familiar story - he had Meccano as a boy and is now looking towards getting back into the hobby. We hope you enjoyed your visit Jeff. Under the terms of our Incorporation, all financial Members of the Melbourne Meccano Club Inc. are covered by the terms of our Incorporation at Club activities - this cover does not automatically extend to other family members. 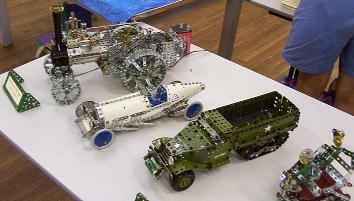 It is proposed to offer Family Membership of the Melbourne Meccano Club Inc. to provide such cover for Members who desire it. Note that Members intending to exhibit at our 2002 Exhibition will need to ensure a) that they are paid up Members at that time, and that b) if they wish to include family members they should consider the Family Membership option. Members of the present Committee believe strongly that there is a need for some "new blood" on our Committee. So is it possible that you might be able to help here? All positions will fall vacant at the start of the AGM so if there is any job you think you could/would like to have a go at, it's up for grabs! A nomination form is enclosed with this Newsletter, so please give the ideas some thought. Nominations must be returned to The Secretary no later than 4 Aug. Door duty - Volunteers are needed. We will have two people at a time on duty for one-hour spells. Last year we fell down on this very badly - the Exhibition Committee does not want a repeat of this. So what about getting involved? It's not hard and really is quite fun. Please contact Jack Parsisson on 03 9789 5796 if you can help. Security - We need volunteers to sleep overnight at the Hall on the Saturday (We have two and need two more). Just think of it - all those models all to yourself for a few hours! Jack Parsisson will arrive at 7 am on Sunday so that the watchmen can go off home for a wash etc. before the exhibition re-opens. This would probably only suit those within a 15 minute drive of the Hall. Again please contact Jack to volunteer. Exhibition Magazine - Meerlu Plumbing (Jack Parsisson) has made a generous donation of $500 to the Club to be spent on the production of a magazine illustrating and describing the exhibition. Your Newsletter Editor has been persuaded to look after the compilation and production (the available funds should allow for a magazine of up to 20 A4 pages with two in colour, laser printed on 100gpm paper - a bit like the NZFMM magazine). But to make the magazine worth publishing we need help from everyone. Photos are required of course, but written information about the models on display is also needed. The best results normally come from the model builders themselves, so tell us about your model. Wall Display - Bruce Douglas has again offered to put together a display of literature to grace the walls of the main hall - post-war material this time. If his efforts on the last two years are anything to go by, it will be worth coming just to see this. 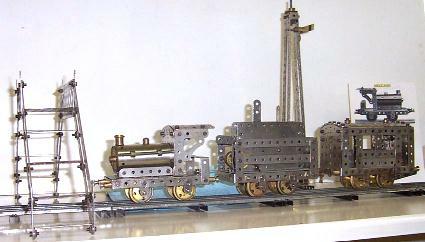 Display Cases - We have three display cases (including one kindly loaned by John Brand) that members can use to exhibit rare and unusual Meccano items. Please contact one of the Exhibition Committee if you are interested. Insurance Indemnity - The Club's incorporation provides protection to individual members against claims of negligence but only if you are financial. Members who are unfinancial on the day of the Exhibition will not be permitted to exhibit. Number of Exhibitors - A show of hands at the meeting indicated that around 18 people intend to exhibit models. Quite a good start, but I happen to know that our Secretary believes we can do better and will be out to prove it! We need Exhibitors!! An entry form for exhibitors is included with this Newsletter. Models of all kinds are sought - from very small to very large, simple to complex, models from manuals, freelance models etc. 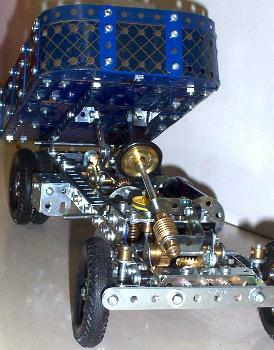 etc.. No need to use pristine Meccano - battered parts give a model that nostalgic look. 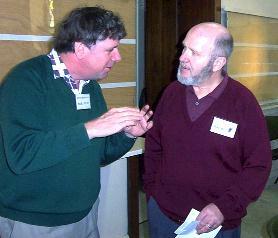 Jack Parsisson provided details of several potential exhibiting possibilities. Sandown Exhibition Centre, 14 July. Several of our members will be exhibiting. 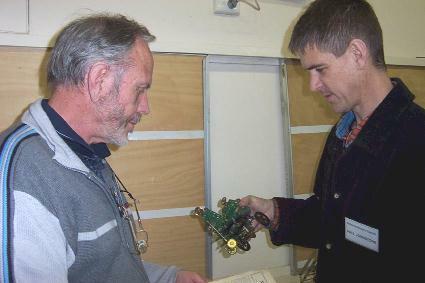 Latrobe Valley Model Railway Association, 7-9 Jun 2003, Kernot Hall, Princes Drive, Morwell. 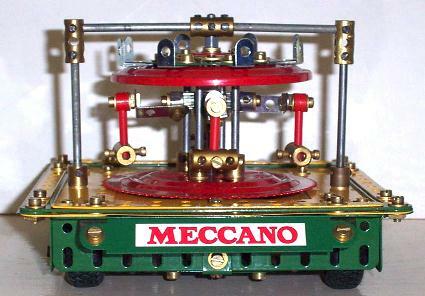 International Society of Meccanomen. Graham Jost put in a plug for this worthy organisation. Membership costs �14 per year (can be paid by credit card) and you also get their Journal, The International Meccanoman issued 3 times a year. What is it? In the words of the Chairman, Adrian Williams: This journal was founded by John Westwood in 1988, the ISM by Dr Michael Adler in 1989. Our founders aimed to create the successor to Frank Hornby's Meccano Guild: promoting international fellowship for all Meccano enthusiasts. See Graham if you would like to join. World-wide membership is around 500 of whom 14 are members of the MMC Inc.! Following the initiative introduced by Jim Osborne the final half hour of the meeting was devoted to an informal inspection and examination of the several models present. Personally, I see this as a positive move - puts the M (modelling) back into Meccano. Paul Johnstone had his Crazy Driver from the April 1929 MM. It is a most amusing model which follows a quite random path yet has an apparently quite systematic arrangement for altering the direction of the steering. 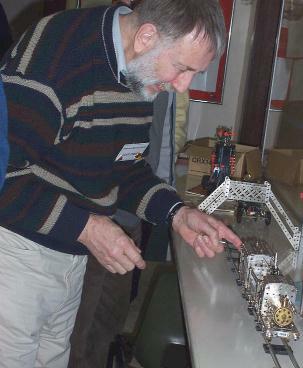 Tony Press displayed his O gauge train constructed in nickel and complete with railway accessories. 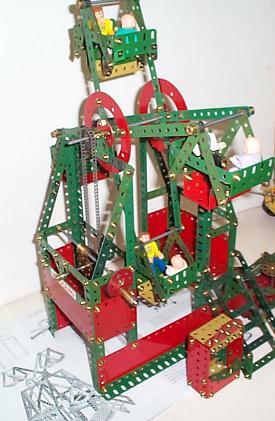 It is a simple model but it captures the charm of the old-style Meccano. This is becoming one of Tony's specialties - hopefully he will produce more. Graham Jost produced the Merry-go-Round (a modified version of that described in the Dec 2001 issue of the NZFMM Mag.) using beautifully re-furbished parts and it looked a treat. A Mystery Exhibitor had a very nice example of the Flyboats from the 1930's K Manual. Everybody, please put your name next to your model!! Peter During had three smaller models, a mobile radar receiver, with both dish and rear wheels driven by a French electric motor, a motor car from a prewar manual and a chair-o-plane fairground ride. 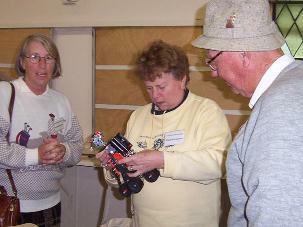 Carol Parsisson showed us her Robot from the Centenary Crane Kit - an interesting model. Carol described some of the modifications she needed to make to get it to run properly - a somewhat unusual account that added new words to my Meccano vocabulary! 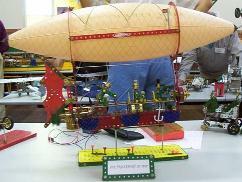 Steve Hatton brought along his Crazy Inventors Airship - seems to be a popular model amongst our members. 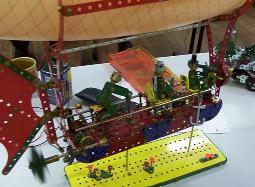 Ron Bassee had his No 10 Blocksetter in R/G on display, very nicely finished and which attracted much interest and animated discussion. Mike Maloney has finished his Tip Truck and very nice it looks. It is motorised but regrettably Mike was not putting it through its paces. I was lucky enough to observe the tipping action when Mike kindly tipped the tray so that I could have a look at the works below. 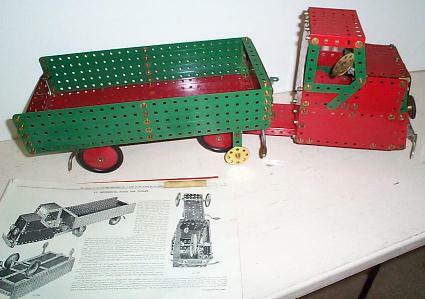 Barry McDonald's contribution was a handsome model of the Mechanical Horse and Trailer in R/G from the 1950's No 6 Manual. Roger Hall produced the Outboard Motor from the No 40 Motion Series Set and Sandra Hall had the Cable Car from the No 20 set. Sandra had modified the model by using extra parts to provide a support for the cable at its upper end - a much more satisfactory arrangement. Michael Bankovski showed us his Retrieval Tractor and Trailer. He had used parts from a window-winder to make the tracks for the tractor - very ingenious Michael! 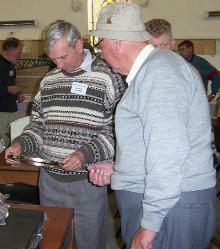 At the June meeting I brought a display of Meccano Pulley Blocks, parts no. 151, 152 and 153. These parts were first announced in the November 1927 MM, each comprising a dark green block without lug, nickel pulley(s) and brass hook. In 1929 a fixing lug was added, this being the only major design change in the 50-year history of the parts. These may be the only Meccano parts where the part numbers relate to the parts, i.e. 151 single, 152 double and 153 triple. 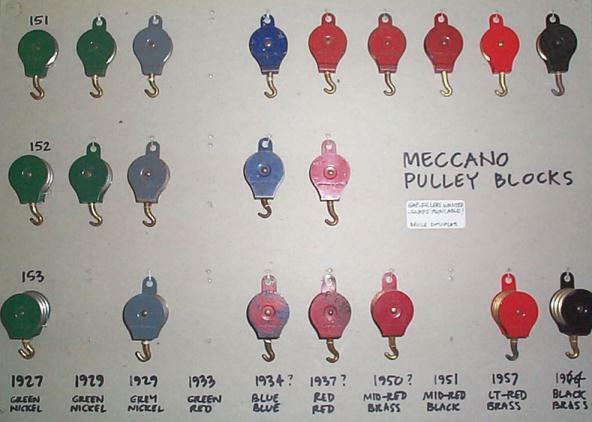 The colours and finishes of frames and pulleys changed over the years, and this is the basis of my little collection. There are also many variations in the stamped markings, and a true fanatic could spend a lifetime looking for these. 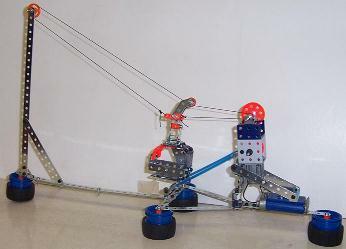 The frame for all three parts is the same stamping, but folded differently to suit the pulley assemblies. The hook is always brass, and resembles the profile of the early small brass Train Coupling, part 121. The pulleys are standard part 22a, fitted over a sleeve and secured with an axial brass pin, and separated by Washers. The 153 is assembled from as many as twelve separate components. 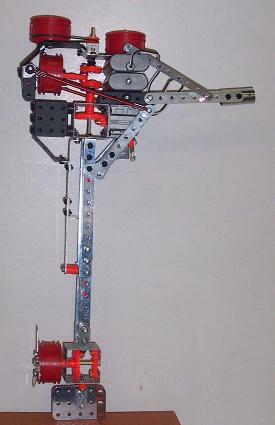 What other Meccano part is as complex (apart from the 167 GRB)? 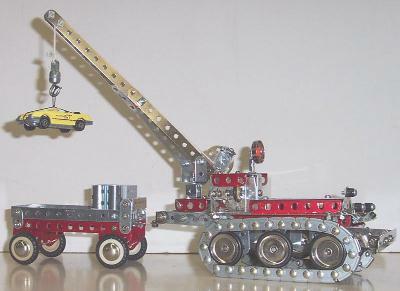 The colour schemes reflect the general Meccano changes over the years. The final version in about 1964 was the black block with brass pulleys, believed to have continued to the end of Liverpool in the late '70's. It is not known whether the 1978 colours (dark blue or deep yellow) ever made it onto the Pulley Blocks (anyone got one?). or whether Binns Road had enough black stock to keep them going. Part 152 did not reappear post-war. Although this reputedly makes it a scarcer part, I believe that among pre-war parts the 153 was the scarcest. After all, it was more expensive! It is not known why the 152 was dropped, when it seems to be more useful than the 153. I have some oddball parts, including a red 152 with nickel pulleys, stamped Meccano Paris - this was given to Wal Maynard during a visit to Europe, by the well-known enthusiast Servetti, a blue 153 which seems to have been factory-overpainted red, presumably to update it to the new 1937 all-red scheme, a post-war 153 with a factory-error extra washer between two of the pulleys, leaving an extra-wide gap guaranteed to trap the cord! Tony Press has a black 153, which seems to be previously unknown to science! It's hard to write about these jiggers without plagiarising the excellent article by John Martin in Meccanomans Newsmag of March 1993, updated March 1994. Recommended for further reading. If anyone's got a green/nickel 153 with lug, or green blocks with red pulleys, or blue with brass, I await your call !! 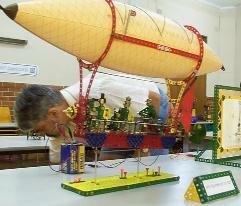 Like good 'ole Pancho Vella, six intrepid Mexican Meccanoites Jack and Carol Parsisson, Graham and Mary Jost, Dave Denner and Kimball Monger travelled North of the Border, for the annual NSW Meccano Exhibition. The first couple approached the venue at Frenchs Forest, from the Nor'west having visited friends in Wagga Wagga. The other members approached from the South. The classic pincher movement! The display trestles were already prepared and all we had to do on Saturday was to spread our black, MMC Inc. table-cloths on the trestles. Where we were joined by Peter Dale and friend from Queensland. Spectators saw an interesting mix of machinery and exhibitors!. No particular theme was evident. However, things that moved as usual, attracted the most spectators. 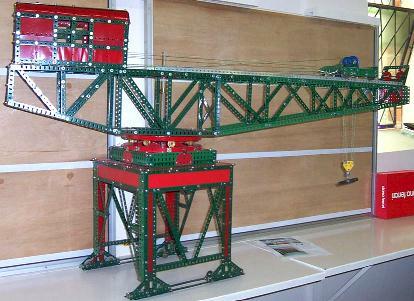 Displays varied from well constructed, red and green, standard Meccano 'Instruction Manual' models. Cheek and jowl with exhibits of more exotic appearance and function. There were many traditional displays. Steam outline locomotives, a giant floating-crane, a ferris-wheel with rotating tubs populated with Teddies. A windmill atop a tower capable of generating 12VDC in a brisk breeze. Two AA batteries reverse the process indoors. Yes! There was a lot of hot air but insufficient to do work!. Several variations of the latest products from Nikko where displayed. Using commendable lateral thinking, Michael Holland, found a way to include that rugger-ball thingy! Result? A most amusing dirigible. 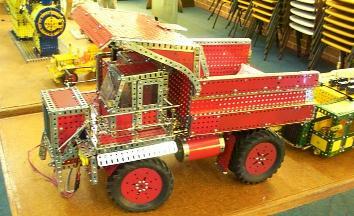 Alongside this, was his scale, Allchin traction engine in kosher perforated metal Meccano. A large scale 'Euclid" dump truck and an underground Low-boy truck took my fancy. These had multiple Power-drives to power and activate the various functions. (Most of us are lucky to have but one!) But, why weren't they running! Even if the wheels had to be jacked up eh! Many more examples of our art, rocked, turned, smelt and made all the noises the spectators enjoy. Being forgetful, I didn't have any chocolate with me and really appreciated a Meccano coin-in-the-slot 'Freddo' dispenser. A nice Meccano representation of a 'National' cash-register on the same table was being used to supply the coins. We were a bit alarmed at a meths-fuelled donkey-engine being permitted to operate. 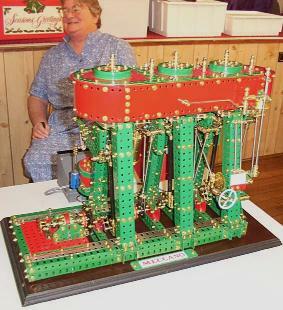 Especially as all it was doing, was driving a Meccano horizontal mill engine! That must have confused the uninitiated!. After the exhibition we repaired to motels to recover, before venturing forth in the evening, to share a meal with our hosts at a local Chinese caf�. It dawned bright and breezy on Sunday and we spent a pleasant morning and luncheon at the home of Malcolm and June Booker. After which we proceeded South at our own pace. The Workers Club in Goulburn can be recommended for service and food at a reason cost and of coarse the Holbrook Bakery is maintaining their tradition of meeting the needs of the hungry traveller. We have settled in up here very comfortably. Even before leaving "Down South", Christel and I discussed joining the "The Old Ghan Preservation Society Inc." We have now joined and it is the best thing we have decided to do up here so far. Christel is part of the "Train Crew" and is in the kitchen helping to cook. I am now a qualified guard learning to drive the ?? locomotive and from June training also to become a driver on our steam locomotive W924. I have always (well since I was 13) had an HO gauge train layout. I now have a 12" to the foot layout 3 days a week to run - much better than one in a room. Another member of the train crew heard about my Meccano hobby and suggested I put a model into the Alice Springs Show on 5/6 July. 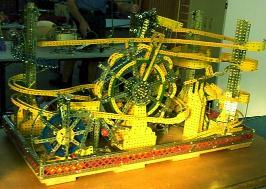 So at the moment I am busy in my spare time making up a traction engine and also a floating crane to put into the show. I have also been to our local hobby shop and ordered the new Meccano train kit and the two new crazy inventory sets. Will let you know what I think of them when they arrive. That's about it from the MMC Inc. Alice Springs Branch in the Top End.